Browsing the Web while you are on the move is one of the perks of owning a smartphone. But not all mobile browsers are easy to use or pleasant to the eye. There is a bevy of great browsers out there for Android smartphone such as Firefox, Opera, Dolphin, etc. When surfing the net and browsing web pages, speed and minimalistic interface also is a key factor to enhance browsing experience. Here, a side-by-side comparison among Miren and Skyfire android mobile browsers on their unique and remarkable features that will help you make an informed decision on which mobile browsers are right for you. Miren Browser is a lightweight web browser that combines full tabbed browser with smart full-screen mode which can automatically hide Android’s status bar. 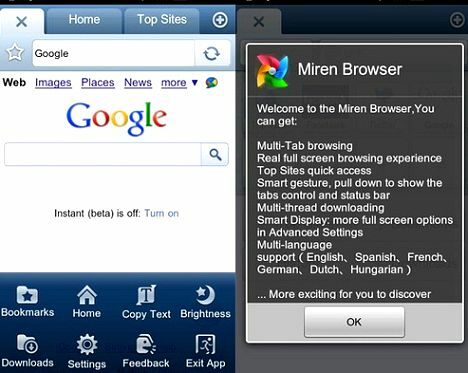 Miren Browser comes with user friendly interface and functional widget. With its minimalistic layout in full screen mode, it leaves users with an uninhibited view of websites and RSS feeds. On the other hand, users also able to add own feed URL and choose the feeds the browser has built. Skyfire Browser is a free mobile browser for Android mobile platform that allows users to personalize SkyBra toolbar. The SkyBar toolbar can scrollable and customizable allow for a larger and more personalized features to be positioned on the toolbar such as Flash Video, Explore Content, and Social Sharing of Content to making web browsing more social experience. In addition, SkyBar also includes a “share” button, Twitter, Groupon and Google Reader integration, sports, news and finance feeds, and quick access to the browser’s settings. 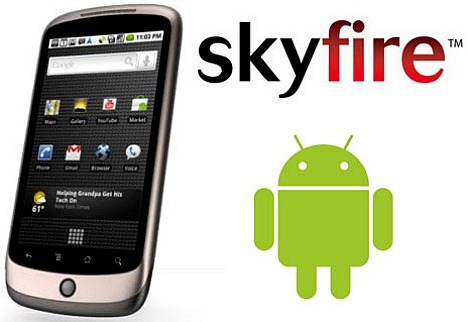 Besides that, Skyfire for Android is one of the most popular applications in the Android Market and has seen over three million downloads. 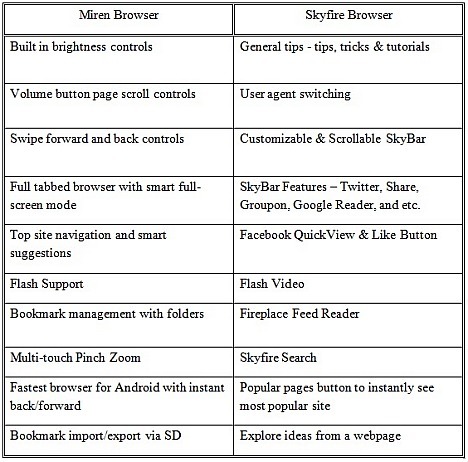 Below is a comparative table among Miren Browser and Skyfire Browser on the features functionality. Interested users who intent to try Miren Browser and Skyfire Browser on Android smartphone can grab free download from Android Market. Download Miren Browser for Android from Android Market. Download Skyfire Browser for Android from Android Market.